This command helps user create curve network defined on the mesh, then create multiple surfaces that fits to the mesh. Both of the operations are automatic. 1. Click Automatic surfaces from mesh from the Resurf menu or type RsAutoNurbs at the Rhino command prompt. 2. Click left-mouse button to select a mesh, then click right-mouse button. 3. The Automatic surface generation dialog box is displayed. 4. Click Curve network to create curve network that is defined on the mesh automatically. 5. Optionally, Click Smooth curve to select a bad curve in the curve network and smooth it to be better. 6. Click Create surface to create multiple surfaces that fit the mesh automatically. Curve network : click this button to create curve network that is defined on the selected mesh. Smooth curve: click this button, then click left mouse button to select a bad curve in the curve network, then click right mouse button, the bad curve will be smoothed. Fitting surface: surface will fit the mesh on the constraint of specified maximum tolerance. Control point: the control point number which is used for creating B-spline curve for every curve in the curve network. The default number is 6. Max Tol: threshold of maximum tolerance between mesh nodes and surface. 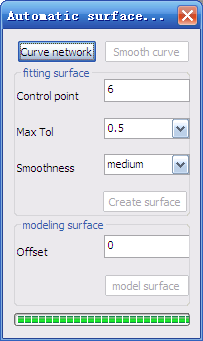 Create surface: click this button to create multiple nurbs surfaces. Modeling surface: model new surfaces from the mesh, the new surface does not fit the mesh on any constraint of tolerance. Offset: the offset value used for modeling surface. The new surfaces will be greater or smaller than the original mesh by adjusting the offset value. Model surface : click this button to model new nurbs surfaces from the original mesh. Automatic surfaces (solid) generation from mesh.